I grew up in Southern Illinois, where my dad ran a historic French fort from the sixteenth century. I lived right on the property, surrounded by historical re-enactors and archaeologists. My dad was an art major, so when he first started managing the fort, he wanted to learn how to do some of the trades from the era that had a more artistic slant. 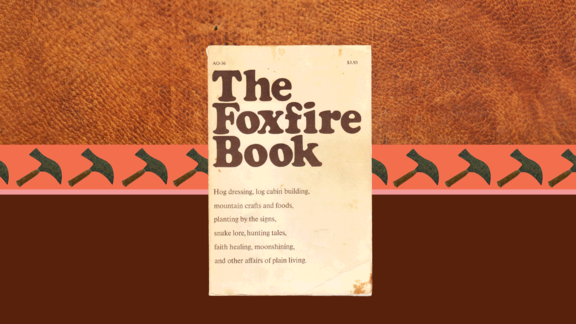 [He] bought an Appalachian how-to book called The Foxfire Book and taught himself leatherworking. When I was a young kid, I remember watching him make every kind of leather good, from bags to belts to shoes. When I started cooking, I went off to the city, and my schedule got crazy. I didn’t see my dad for a long while. 10 years ago, I decided I wanted to reconnect with him, and start a project where we could work together and build a relationship. I told him I wanted to learn how to do leatherworking. I think I was at a point in my life where I finally realized how intriguing my upbringing was, and I wanted to learn more about the historical aspect of where I lived. I told my dad I wanted to learn how to make eighteenth-century shoes, like the ones the re-enactors wore. I’ve always been a fan of shoes—they’re the one item I’ll spend extra money on. I came home, and over the weekend, we made a pair of shoes together. He sent me home with some extra leather and tools, and soon enough, I was making shoes for my friends and family—my brother and sister are re-enactors, so I’ve made them their own pairs of buckle shoes. There are so many steps involved in making a pair of shoes, and you have to pay attention to every little detail. This sounds crazy, but leatherworking, for me, is like meditation. There is a certain level of focus required, and that focus takes me completely outside of my restaurants. Working with leather has become my release. A way for me to check out of work. And I do absolutely everything by hand; I don’t even have an industrial sewing machine. So far, I’ve made a dozen or so shoes. Each one takes me about a month to get done; it’s a super time-consuming process. But the ability to make something that is well-crafted and will last a long time, something that reminds people about the importance of still taking the time to do things the old-fashioned way—that’s amazing. I’m moving into a new house, and I’ll definitely be setting up a workshop for my leatherworking there. My next goal is to learn how to make the traditional work boot. Maybe I can make a few pairs for my chef friends. The best part of this hobby, aside from the meditation part, is when people get enthralled by the fact that they have a pair of shoes that I made. I sew, too—shirts, leggings, moccasins—but there is something special about leather. It’s durable. It produces this “wow” moment. There’s a satisfaction that comes with it. It’s like nothing else. How the world of cooking has the power to both condemn and redeem. Chef Soulayphet Schwader and the journey that would define his life. Chef Ford Fry on the music in his head.